You're an absinthe fan. How much have you had in one go? Half a bottle with Steven when we were writing the album. I appreciate it as a long drink when you make it properly with water and burn it with sugar in a spoon. It takes you to a different level of drunkenness when you're sensible about it. I like to drink it with cranberry juice. I invented the best cocktail in the world - absinthe, cranberry juice and Grolsch lager. Kids these days! See what the fake Czech marketing has done to the history of absinthe? Someone needs to tell poor Betty/Megan that, in fact, burning sugar is not how to "properly" prepare absinthe. It might be the only thing to do with a bad Czech imitator, but we here at InAbsinthia would break down and cry if you tried this with a real absinthe. As for "a different level", we must admit to having the same discussion here. Some of us notice a different kind of "buzz" when drinking enough absinthe, while others don't. Whether it is physiological or psychological, you may have a similar feeling. But we're just plain happy with the taste and theater of absinthe, and do not need any promises of a legal "high" to enjoy our absinthe. And that cocktail - Oy Vey! Again, nothing you would want to subject a real absinthe to, but it might be the only way to finish off your bottle of "Crapsinth". Tell us if you ever try it! A very interesting clip from the show "Modern Marvels". 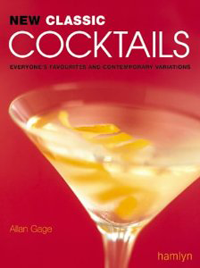 They did a couple of episodes on modern distillation methods and absinthe is featured in this excerpt. Mad alchemist TA Breaux and the Combier Distillery are the stars of the show and there is some great footage showing the alembics and the process. 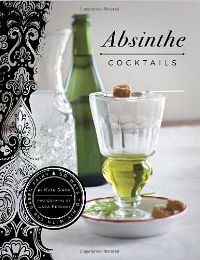 It also begins with a very nice thumbnail history of absinthe. Highly recommended! The "flying monkeys" from the good folks at Liqueurs de France finally arrived the other day here at Chez InAbsinthia and we couldn't be happier. It took less than five days, including the weekend, from clicking the "Submit Order" button to the USPS hand delivering the package. We were a little surprised it wasn't a courier, instead a real US postman doing the delivery, but as long as it all works out well in the end, we're happy. The box itself was rather flimsy, but each bottle was carefully wrapped in a nest of solid Styrofoam, although the Montmarte was trying to peak out the top. We ordered three bottles of absinthe - Montmartre, Eichelberger 68 Verte and La Ptite, a Swiss La Bleu. I guess we weren't paying close enough when we ordered, as we were surprised by the small 500ml bottles of Montmartre and Eichelberger, while the Ptite was 700ml. But each should be more than enough to indulge in. And an indulgence it is, as absinthe isn't a cheap hobby! 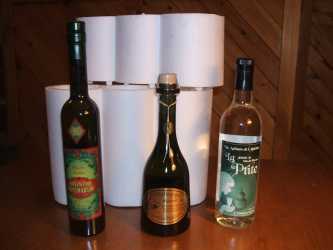 Shipping alone cost US$65, bringing the total cost of these three bottles to a staggering US$240. Thus, our cravings are only satisfied a couple of times a year. It's so much better when you are doing the ordering, as the currency used on the LdF web site is English Pounds, so it is much easier to swallow a charge of 123.50, at least until the conversion kicks in. But it was an easy and safe process, and, as mentioned, very fast, so we should have reviews on all three bottle soon. 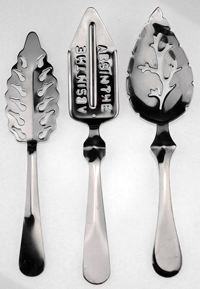 There are two "colors" of absinthes, green and clear. While there are other disturbing colors for sale out there (red and black come to mind), these are really the only two "colors" you will see from any absinthe with a claim to authenticity. The greens range from a pale green tint, to a bright green radioactive color, while the clear ones are usually just that - perfectly clear. It all has to do with the recipe used to make the absinthe. The famous color is, of course, green or verte, which leads to all kinds green imagery, unabashedly used even here at In Absinthia. La fee verte is the green fairy, a muse reputedly seen by many of the more bohemian authors. An important facet to any green absinthe, the shade can often be an excellent indicator to the final quality of the absinthe. Original color (ie, before louching) is an important part of the Fee Verte grading system, as a natural color is much preferable to a nuclear, artificial green. The green color comes from the last stage of making absinthe, where the final distillate is soaked once again in a mixture of green herbs like petite absinthe and hyssop. As it adds an important dimension to the taste of a good absinthe, those manufacturers that artificially color their absinthes are missing the point! A clear absinthe comes about due using a different recipe, which generates a very clear, crystalline liquor. Most famous as the result of the Swiss process of making absinthe, it generally results in a slightly less alcoholic absinthe (around 55%, instead of the 65% or more for verte). These clear, Swiss, absinthes are often called La Bleue, for the beautiful blue-tinged louche you get from the better labels. Clear French absinthes are also known as blanche, which is more literally white.